Vision therapists often use online games to help patients make the best use of their vision. Therapists are optometrists who specialize in improving the brain/eye connection. If your brain, eyes and the muscles surrounding your eyes don't work well together, you may have difficulty processing the images you see. Processing disorders can affect hand/eye coordination the ability to recognize words and letters or remember what you've read. 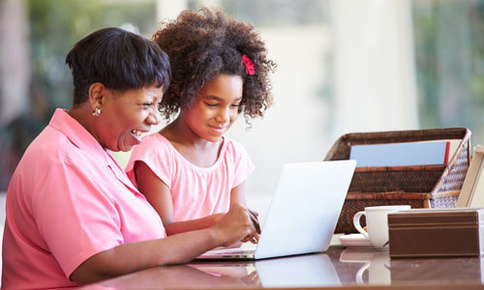 Several online games can help you or your children improve these visual processing abilities. Be sure to consult with your eye care professional before you or a loved one try online games! The Eyetricks website offers a variety of 3D stereograms that can be helpful if you or your children have eye teaming difficulties. If your eyes don't work well as a team, you may experience double vision, fatigue, blurred vision, headaches and eyestrain. The problem occurs when the brain has difficulty turning the two images it receives from the eyes into one image. If your child has an eye teaming problem, he or she may quickly grow tired when reading or performing other types of close work. Stereograms use 3D pictures that are hidden until you look closely at them. As you stare at the images, the hidden pictures gradually come into focus. Good visual memory is essential to remember what you've seen or read and is particularly important for athletes. Without good visual memory, it's much harder to keep up with the movements of the ball on the playing field. Memory matching games offer a fun way to improve this ability. You'll find plenty of matching games, like dkmPairs, online. In this game, you flip over one tile a time by clicking on it. You must then flip over another tile and try to match the first one. If you fail, the tiles turn over, and you try again. Scholastic I Spy games can also boost visual memory. The website offers several matching games and a few other games that encourage players to find particular objects in a picture by zooming in on various sections of the image. Peripheral awareness increases your ability to recognize and process images at the edges of your vision. A game like Catch Numbers is helpful in improving your vision span and may quicken reading speed. During the game, a series of numbers appears on the screen, then quickly disappears. You type in the numbers you saw, then move on to the next set of numbers. Playing Tomato Bounce may be effective in improving your dynamic visual acuity, which is the ability to see objects in motion clearly, plus also helps you follow a moving object with your eyes. As tomatoes appear from the left side of the screen, you must manipulate your spatula under them and prevent them from falling onto the ground. While you're concentrating on the first tomato, another tomato appears from the left, requiring you to now concentrate on multiple tomatoes. The Internet offers plenty of games like Tomato Bounce that require shooting, popping or catching moving images. Multiple levels make the games interesting and challenging. If you don't have good visual discrimination skills, it can be difficult to spot differences between two objects. Children who have poor visual discrimination may have difficulty choosing socks that match or might confuse letters that look somewhat similar. Sometimes, a visual discrimination problem is mistaken for dyslexia. Hidden247.com's Spot the Difference game presents two side-by-side pictures. When you see an item in the first picture that doesn't appear in the second, you click on it. Once you master the simpler pictures, you can move on to a more challenging level. Playing Hawk Eye can also improve visual discrimination skills. During the game, a group of birds briefly appears on the screen. One bird does not look like the others. You must react quickly by clicking on the area of the screen where you saw the unusual bird. If you do, you'll be rewarded with an explosion of bird feathers. Online games are just one tool vision therapists use to help children and adults improve their vision. Vision therapy is tailored to your particular condition and involves exercises, prisms, filters, lenses and off-line games and activities. If your child's vision issue causes difficulty at school, vision therapy offers a simple, fun way for your son or daughter to strengthen his or her abilities. Adults can also benefit from vision therapy. Whether you're concerned about constant eyestrain and headaches, or you would like to be a better athlete, therapy can be beneficial. Find out if vision therapy is a good option for you or your child by scheduling an appointment with our office.